We share all the household responsibilities, but because of how our schedules work out Steve does the bulk of the child care and whatever chores have to get done during the day; mostly this involves washing the same three sippy cups four-hundred times and pulling Anna's hands out of the candy bowl in seven-minute intervals. I don't know if it's the nature of our personalities or gender differences, but not once has Steve asked for time away. He's never complained about being exhausted by our daughter, beaten down by her demands, her after-market rotten attitude, or her inability to clean up after herself. He's never said to me, "Honey, I just need to go get a coffee or meth or something for a few minutes." And yet he can glance at me and know the second I'm about to grab my keys and slip out the garage door for a ten-minute latte run. I admit to you all that I need these breaks. That sometimes I'll walk out of my office into the living room, greet my family, and within seconds Anna's yelling to talk over whatever conversation Steve and I are trying to have, we both cut off sentences to ask her to say, "Excuse me," and she complies, now shouting, "EXCUSE ME!" insistently, even louder than her previous interruptions until there's nothing but half-finished sentences filling the air. In that moment I just want to return to the quiet of my little office and shut the door. I'm okay with not being stay-at-home-mom material. I know if I needed to I could manage it, but I am in awe of women who choose it and who are great at it (though I suspect as a condition of motherhood none of them actually consider themselves great at it.) But damn I have hella guilt over being a working, fulfilled mom with one measly kid who's really good and super adorable, and a husband who just handles what needs to be handled and who understands my frustrations and gives me the space for them, and still feeling the need almost daily to be away from them, just for a few minutes. Please chime in on the topic, even if it's to say, "Someone call the whaaaambulance." 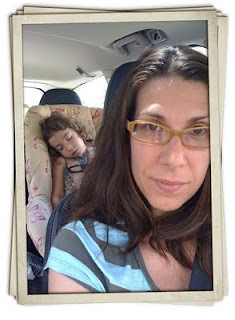 And click over to Mommyfriend's vlog on the subject of working mothers, me time, and guilt.